With the ensemble Pygmalion, Magnus Staveland, Eva Zaïcik, Renaud Bres, Giuseppina Bridelli, Geoffroy Buffière and Olivier Coiffet. For Monday night, this was a special occasion on many accounts for the BBC Proms. 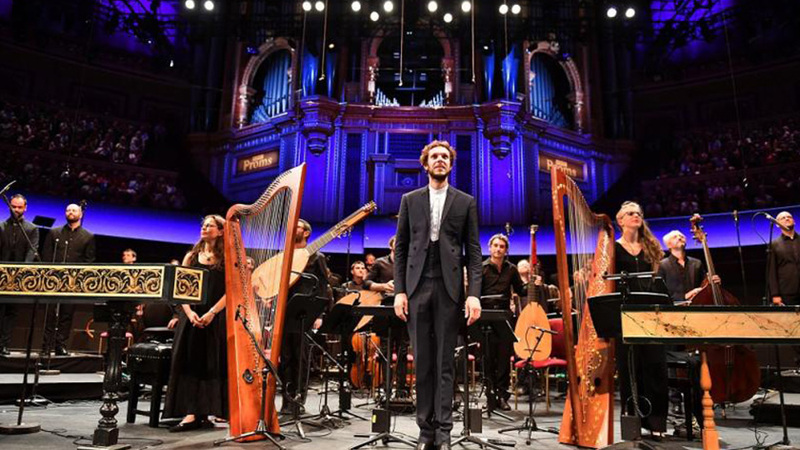 It was the debut for award-winning French early music ensemble Pygmalion and their artistic director Raphaël Pichon. The 32-year-old violinist, countertenor and conductor had dreamed of developing a ensemble – now called Pygmalion – ever since he was an adolescent musician, and the Proms got to see the first glimpse of Pichon’s musical wizardry and genius. The work performed was Monteverdi’s exquisite 1610 Vespers. This year Monteverdi fans celebrate the composer’s 450th anniversary since his birth. The music was produced while Monteverdi was a choirmaster to Vincenzo Gonzaga, Duke of Mantua, and he took every opportunity to compose the piece as he saw fit. Rather than simply writing the work as a compendium for choir chapels and churches, such as St Mark’s in Venice or St Peter’s in Rome, he included Vespers psalms, motets and a mass setting – the creation of a spectacular kaleidoscope of spiritual music. Proms 22 was uniform and meticulously set up – it went off without a hitch. For every new section, the choir and instrumentalists silently tiptoed and moved to another station to accommodate space for the next soloist(s) or musician(s) performing next. Speaking as someone who has been attending Latin choral masses as far as she can remember, Proms 22 was a glorious and warming concert. The golden light and musical waves that shined on Pygmalion’s period instruments made me feel right at home, yet for anyone seeing Monteverdi’s Vespers for the first time, including secular audiences, they’re not missing out as Vespers can be enjoyed by anyone. For the past 400 years, it has remained a magnificent piece of music marveled by many, the world over. The beginning was strong. The Pygmalion singers, seemingly bass soloists, had their backs to the audience singing plainsong in the dark. Suddenly from the upper gallery silver-toned tenor Emiliano Gonzalez Toro sang from high with clear diction and projection, calling to God. Then, the hall’s lights turned on and the brass instruments and sackbuts were ablaze with the entire chorus. Kudos goes to the speedy leading soloists for getting to the upper gallery in time to sing their part from the main stage, including the tremendous voices of Magnus Staveland, Eva Zaïcik, Renaud Bres, Giuseppina Bridelli, Geoffroy Buffière and Olivier Coiffet. Pygmalion’s musicians are a brilliant company with their lucid and intelligent performing with recorders, violins, cornetts, harpsichords, sack sackbuts, theorbos, harps and violas de gambas. Pichon conducted with poise, confidence and alertness, smiling proudly to be centre stage with his ensemble of talented individuals. His passion and knowledge for the work’s musicality were evidently clear. Together Pichon and Pygmalion gave insight into the versatility, stylishness, and elegance of Monteverdi’s astonishing work. This will, most definitely, go down as one of my favourite Prom events for 2017.